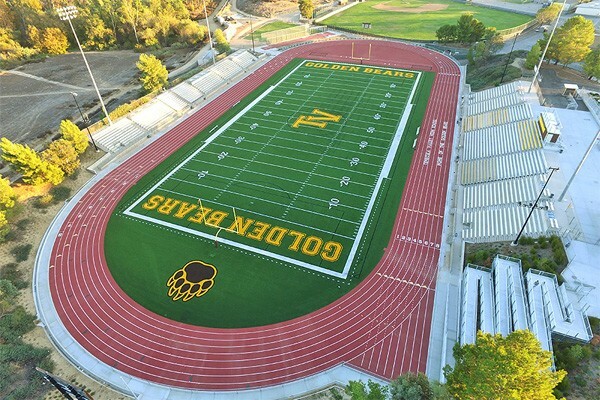 In late 2011, Big Giant Media was approached by the Temecula Valley High School Golden Bear Booster Club. The football team was in a renaissance period, and was looking not only to redefine itself on the field, but also in the eyes of the fans. Key members of the coaching staff had experience in marketing, and realized a re-branding would help rally the players and renew interest in the community. They needed something strong, dynamic and most importantly, something that looked collegiate. They needed something that would pop on the uniforms, and translate to increased merchandise sales for the booster club. They gave us a call, with a simple request - make it great! The Problem: Temecula Valley High School started small - very small. In 1985, the high school opened with a student population around 450 students, and was the first high school in a multi-city school district. Twenty-six years later, it had a population of nearly 2500 students, and shared the area with five other, much newer public high schools. The original Golden Bear brand, hastily created years ago, was struggling to look relevant in the face of the competition. And to make matters worse, most organizations on campus had gone rogue - illegally co-opting logos from various other sources, including a local college, a minor league hockey team, and an NBA franchise, among others. The Booster Club was uncertain which logo was actually the official one for the school. After being in existence for 26 years, the school was suffering a common problem - it had lost touch with it's brand. Establishing the New Direction: By the time preparation for the new football season rolled around in early 2012, Big Giant Media had established a look the Golden Bear community could enthusiastically support. Keyed around the "Full Body" bear and the "Swoosh Bear" specific to the football helmets, the new identity embraced a bold, more energetic look. More importantly, with the collegiate look desired by the booster club, the new identity immediately began to create a buzz in the community. The Growth: With any good brand, the opportunity for growth is abundant. Once the new Golden Bear brand was unveiled, plans were established to adapt the look to a variety of different uses. Within the first year, the booster club had commissioned multiple apparel item designs, vehicle decals, marketing materials, and a new website. Other organizations on campus immediately embraced the new design and commissioned work for themselves. And the fans bought everything on the shelves. The Golden Bear identity was a hit! The Evolution: A great identity has a life of its own - often outpacing even the original scope of the design. After four years in use, and four successful football fundraising seasons, the Golden Bear identity had become a fixture in the community. Embraced by the student body and faculty alike, the Swoosh Bear was appearing on apparel items all over town. Sales had been great. But, the booster club had its work cut out for it - how to offer merchandise that the home crowd didn't already have filling out their closets? Big Giant Media suggested a unique plan - add some siblings to the Golden Bear family. For the 2016 season, Big Giant Media developed two new bear poses to enhance the Golden Bear identity, based on the established design. The Frontal Bear and the Bear Face made their debut to an enthusiastic reception. The Golden Bear identity finally felt complete! The Future: Initially created to reinvigorate an evolving football team, the Golden Bear identity has grown to has permeate all aspects of TVHS life. And it continues to expand its influence, finding itself in designs all across campus and beyond. Big Giant Media staffers have even unearthed completely unauthorized, bootleg team items hanging from the racks at the local WalMart! As they say, if others steal it, it must be good! Big Giant Media is proud to have made a lasting impact on a local institution. And with our continued involvement in the TVHS organization, Big Giant Media looks forward to many continued years shaping the identity of Temecula Valley's Golden Bears.